…the task of the educator lies in seeing that the child does not confound good with immobility, and evil with activity, as often happens in the case of the old-time discipline. And all this because our aim is to discipline for activity, for work, for good; not for immobility, not for passivity, not for obedience. Once when I was in Nepal I saw a two year old sweeping his fathers’ shop with such a look of intense concentration that I could not doubt the seriousness of his effort. Children have always played a role in the work of the family. It is a new notion, this fantasy of childhood as an idyllic refuge from the ugly world of adults; it speaks more to how we see our own lives than to how children see their own. From most ancient times, from the first flickerings of civilization, the great task of children has always been to become adults. All day they would spend with their family, their tribe, their kin, working to the extent they could and contributing meaningfully to their own survival. We should not idealize the harsh reality of subsistence living; but we do a terrible disservice to ourselves if we denigrate the value of work. If the games of children are found to be filled with fantasy constructions, this is because the last remaining place for these seems to be in childhood. Adults, too, once believed in elves, fairies, giants and witches. These were real entities in the world, unseen powers that were believed to affect our lives. Now, the last redoubt for this part of our heritage lies in the play activities and fantasies of childhood. This is fine, but just as children may pretend to possess magic powers, they also like to pretend to have adult jobs, such as doctors or astronauts or teachers. The essential role of fantasy is to help children explore and prepare for adulthood through the tool of their imagination. Because we often misunderstand the nature of childhood, we also often misunderstand our own children. We do them no favors, protecting them from responsibility. When a child acts out, it is often because no meaningful contribution is made available to them. Think of parents rushing around preparing for dinner guests. The dishes must be cooked, the table set, the house cleaned. 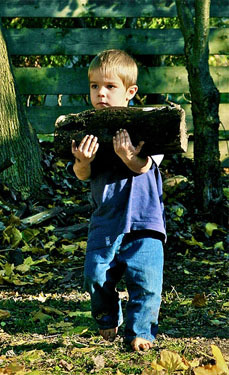 Why is it that in this flurry of activity children are often underfoot, getting in the way? Frustrated parents may tell a child to “go play”, or resort to punitive discipline. A thoughtful observer may note a shadow of disappointment across a child so banished from family activities. It is a simple formulation: if there are important things happening, and I may not contribute, then what does this say of what I am and who I may become? It is not surprising then that children with too much of what we call “freedom” become locked into a state of permanent emotional childhood. There are many persons, physically adult, who spend their days in non-productive activity, such as playing video games in their parents’ basements. Even adults don’t cherish freedom without responsibility, though they may imagine they would.1 Workplace studies have compared different task sets, and have found that even with the same pay, persons report much greater job satisfaction when they have greater responsibilities. Dr. Montessori designed her classrooms with this insight into human nature. Children are free to choose any work they have been taught, but they must complete it and then get it ready for the next child, including putting it away neatly. Children may have snack when they are hungry, but they must prepare it themselves and clean up any messes they make. Many a Montessori classroom has a posted sheet of classroom chores and it’s a marvel to see children treat these chores as if they were privileges. As children age we imagine them to be ready for more responsibility. In most US states, one cannot work before 14, drive before 16, vote before 18 and drink alcohol until you are 21. Oddly, we do little to prepare them for these responsibilities. We teach them to drive, yet 400,000 teenage drivers are seriously injured every year.2 We give them the vote, but cut civics education from our curricula. Regarding alcohol, one day they cannot drink legally, the next they can; should we be surprised by the epidemic of binge drinking and alcohol poisoning? The Montessori Method is not simply a pedagogical technique for communicating facts. It is a proven system for helping children develop independence and assume greater responsibilities. This is one reason why Montessori children are often perceived as more “mature” than traditionally educated children. In our classrooms, yes, a child is free. They are free to move about, with purpose. They are free to use the works they please, so long as they use them appropriately. An essential part of a healthy freedom is responsibility, and our classrooms satisfy this need. Are there ways to include even the youngest children in the activities of your family? If you are a teacher, are there additional ways the children may contribute to the care of the classroom? Is work important to you as an adult? Why or why not? If you didn’t have to work, how would you spend your time? Would it all be recreational, or are there certain activities (eg charity) that you would want to continue?